Home > Little & Big Tee-sers > 18 Little Tee-sers 9" x 12" Personalized Golf Sponsor Signs with Display Stakes and FREE SHIPPING! THE LITTLE SIGN WITH A BIG IMPACT! 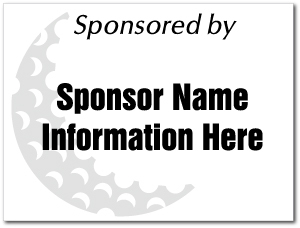 18 personalized golf sponsor signs with FREE SHIPPING! Little Tee-sers! Don't want to break the budget on golf tournament signs? We have the solution for you. Little Tee-sers do the trick at half the size of our bigger 12" X 18" sponsor signs and without a big impact on your fund raising dollars these smaller tournament signs are the just the right size and answer to tighter budgets. You get 18 personalized sponsor signs with display stakes and FREE SHIPPING! THE LITTLE SIGN WITH A BIG IMPACT!